Before the days of interest in metformin as an anti-neoplastic agent, a performance enhancing drug or a longevity promoter, it was just given to T2DM patients to help lower blood glucose levels. These folks, as a group, quite often have significant renal disease. Which can render metformin and lactate cumulative in the blood stream and lead to a life threatening lactic acidosis. The mean blood concentration which gets you an ITU bed was 32mg/l. Now this is a clinical paper, written by clinicians. Nothing wrong with that, except they use Noddy units which makes the metformin concentrations extremely difficult to relate to the vast body of metformin research, which uses units of millimolar or micromolar. 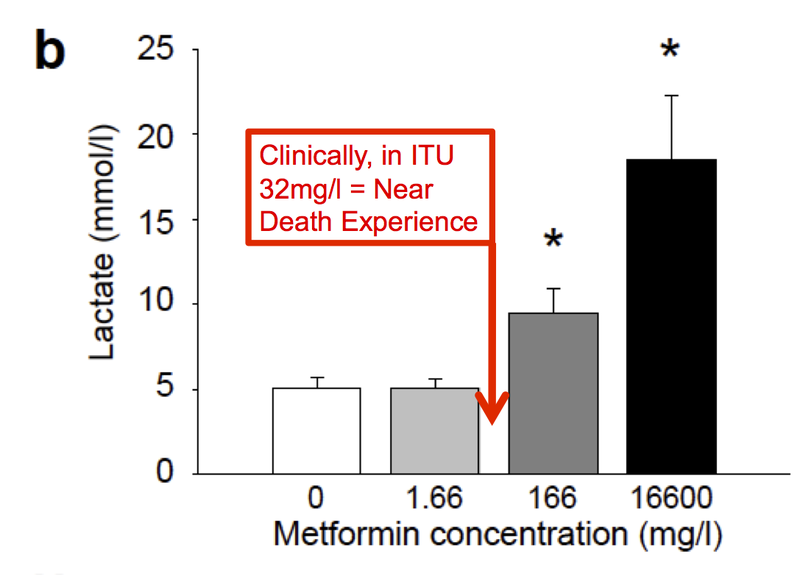 Bear in mind that these are very chronic exposure values and metformin is thought to be progressively cumulative within the mitochondria on chronic exposure. Of course, complex I is intra mitochondrial and there will be some dependency on cumulation in getting significant effects at this site. What we can say is that, in the above diagram, there is not enough inhibition of complex I to raise lactate production in platelets, an extra-hepatic tissue (hepatocytes may be slightly different), unless we are using near-death concentrations. What is not hidden away inside the mitochondrial matrix is mtG3Pdh. It's on the outer surface of the inner mitochondrial membrane and will be exposed to whatever metformin concentration that manages to get inside the cell. Here we have a significant effect on the oxidation of glycerol-3-phosphate at micromolar concentrations. Admittedly by 50μmol we are looking at very much the upper end of therapeutic concentrations but an effect is clearly visible at this level. We can say from the platelet paper that exposure to 250μmol (black circles at the bottom of the graph), if sustained, will put you in the ITU with potentially fatal lactic acidosis. 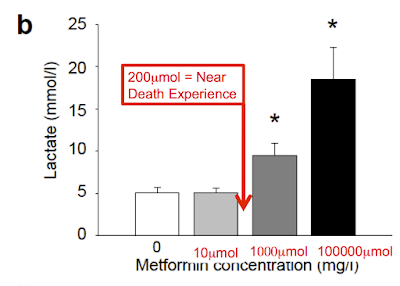 Because mtG3Pdh is exposed to cytoplasmic (non cumulative vs mitochondrial) metformin levels it will see the drug at plasma concentrations (or slightly less) and it will see these concentrations as soon as metformin enters the blood stream. If you want a performance enhancing drug for endurance exercise, say a cycle race taking about three hours, you can pop a single metformin 500mg tablet one hour before the start of the race and extend your time to exhaustion from 167 minutes to 191 minutes. That might make some difference to winning vs not finishing. Equally, there is no acute effect on lactate levels in the same study. This is no surprise as I find it difficult to envisage acute complex I blockade, to lactate generating levels, as a performance enhancing ploy. TLDR: metformin probably works in the cytolasm on mtG3Pdh. Rising lactate may well indicate mitochondrial cumulation and some degree of complex I inhibition. Extrapolating benefits from studies based around millimolar concentrations in-vitro may well put you in to the ITU if you try them in-vivo. Thankfully, we have much better ways to lower BG - resistance training rapidly increases active muscle mass. Yeah it is boring, takes time, harder than swallowing a pill.. They banned meldonium from the Olympics(and other places) why not metformin as well? Mucking about with mitochondria meds obviously has some risks - I do think dietary interventions could potentially help keep a better supply of MtDNA. 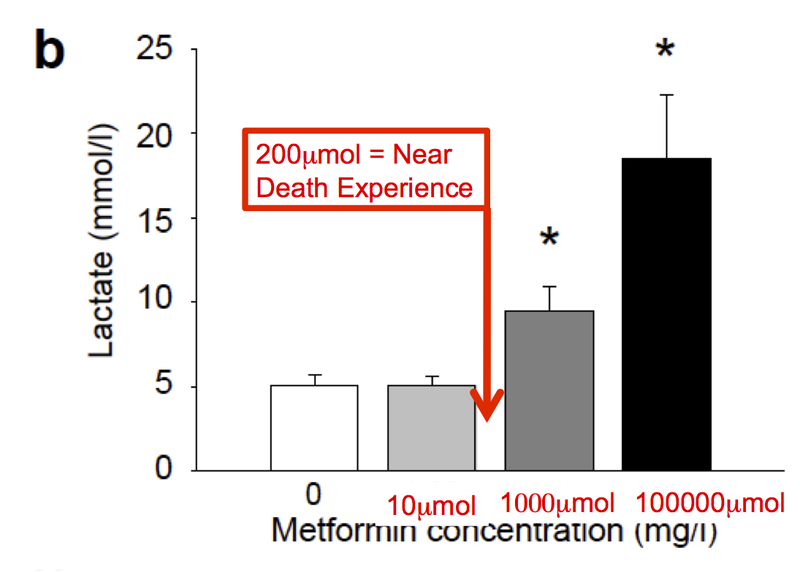 Dr.Horvitz (@IMWhorvitz on Twitter) asked for a comment on this paper http://www.sciencedirect.com/science/article/pii/S2212877817302648?showall%3Dtrue%26via%3Dihub "Metformin causes a futile intestinal–hepatic cycle which increases energy expenditure and slows down development of a type 2 diabetes-like state"
Given you were writing about it I thought I'd comment on it here and see if there's anything to learn about why the 10 patients suffered from lactic acidosis on metformin. the human equivalent dose of the 500mg x kg given to the mice was about 3 x 1,000mg per day. mice were on a high-fat high-sucrose diet. the authors note "that lactic acid released into the portal circulation does not leave the enterohepatic vascular bed and therefore does not reach the general circulation". qPCR of MCT-1 in the metformin mice shows lower expression of the transporter in heart, liver and muscle but not the intestinal wall (in fact the expression is slightly higher in the latter but not to the point of statistical significance). in mice taking metformin, the LDHa/LDHb ratio is much lower in the liver but higher in the intestinal wall (higher ratio = more conversion of pyruvate to lactate). im not sure what this futile hepatic cycling is all about - since BAT didn't seem to increase in these metformin taking mice, maybe the futile cycling is the alternative 'energy buffering' measure? 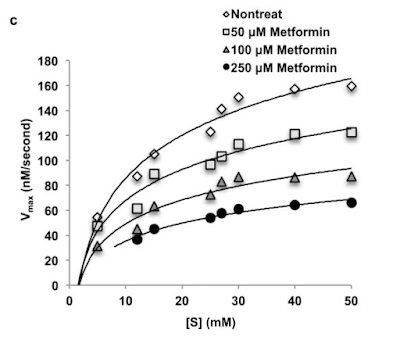 I just had a quick look at the abstract and my feeling is that the GI tract will be seeing waaaaaaaay more metformin that even the liver, both of which will "see" more metformin than the systemic circulation. Complex I blockade and subsequent lactate generation in the gut would be fully expected. In general the liver can metabolise lactate very efficiently so very little of this would penetrate through to the systemic circulation. If you manage to get enough metformin absorbed to blockage complex I in the liver then you are en-route for systemic lactic acidosis, especially if renal excretion of lactate (and metformin) are buggered. In the mice the lactic acidosis was ONLY in the gut/portal vein, not systemic. Ah yes, makes sense that the lactate levels seen in that study derive from differences in concentrations of the GI vs systemic ones. Talking about futile cycling, this is out of left field but, what about T1D patients taking Metformin? About it coming back to mitochondria, in the words of Al Pacino "just when I thought I was out...they pull me back in"
Dear friend, I am a frequent reader of your blog, I would like you to talk about acarbose, according to Dr. Jason Fung it is better than metformin for diabetes and or insulin resistance. I've followed you for years, and understand just enough to keep me coming back. 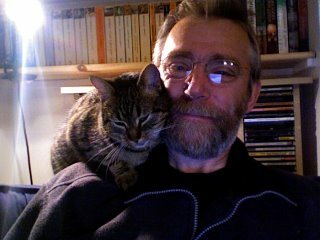 I'm type 2 diabetic, diagnosed in my fifties. I also have a genetic metabolic disorder which prevents me from burning glycogen in my muscles (McArdles disease). I have controlled the diabetes with a low carb diet for about ten years, but have seen my fasting glucose rise slowly over that time. I do know the more strictly I control my carb intake the more stamina I have. Peter, where have you been? Make January 16th World LCHF Day.